Jay Electronica says his album will also be coming soon. We're constantly awaiting new music from Jay Electronica. If we're lucky, he'll drop off a few tracks a year but so far, we haven't heard a whole lot from in 2018. Unlike the way he releases music, he's a bit more active on social media and sometimes interacts with fans on the social media platform. Earlier today, the rapper hit Instagram and gave fans a bit of an update on when they could expect new music. Jay Electronica hit the 'Gram today to share a post of himself doing one of his favorite things in life: riding his motorcycle. The rapper captioned the post, "one of my favorite things in life to do. It’s #brrrap season again. #BikeLife #ClutchDumper." However, fans were clearly more interested in finding out if he has new music on the way. One of his fans commented, "someone always has to mention this in every post but drop that album please." 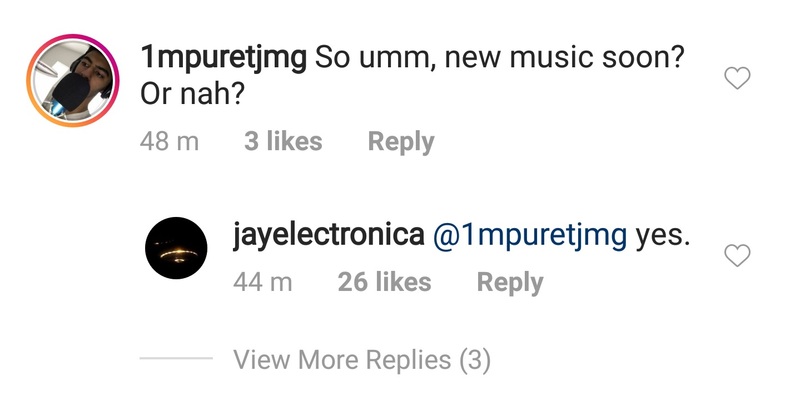 Electronica replied, "no worries. soon come." Another fan commented, "So umm, new music soon? Or nah?" Jay simply responded with, "yes." Hopefully, he actually does release his album. Fans have been eagerly awaiting for it to drop for years at this point. However, it does seem like it could be possible. Earlier this year, he embarked on an eight city North American tour so it seems like he's been plotting to drop something this year. Hopefully, the project sees the light of day before the end of the year.